It feels as though this is my first 'autumn' inspired outfit of the month, with tights out in full force and layering to a maximum-hello three layers of knitwear (it was exceptionally chilly that day). I even went as far as donning a roll neck jumper (another first of the season). I have been meaning on wearing this combination (roll neck and denim shorts) for a while as I love the contrast in fabrics but also how the look has a 70s meets grunge inspired feel going on. As much as I love summer there is something about autumn which I always look forward to, from layering every warm item that you own to wearing those duster coats and chunky knitted scarfs. I don't think I have mentioned this on the blog but I am moving up to Nottingham to start Uni (studying Fashion Communication & Promotion) in a few weeks time, which is both a very exciting yet nerve-racking experience. 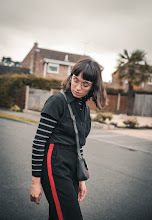 Now with the way blogging comes into this I truly have no idea who will take my outfit photos, as I currently have my sister on board to take photos (give her a follow @ima.mermaid). So if blogging becomes a tad sporadic in the upcoming months/weeks I deeply apologise, however I'm sure I will find a solution to this problem it might even have to involve a tripod and remote (just like the good ol' days). We will have to wait and see. Also if anyone has been/lives in Nottingham I'd love to know the must-see places to visit as I am stranger to the city.